It's not often I drop my back sandwich, but when I first laid eyes on Chambers Bay there was ketchup everywhere. I mean, just look at it. It's extraordinary. The first thing to note – this is a public golf course. Anyone can play here. At worst (non resident of the area) it'll cost you about £150.00. 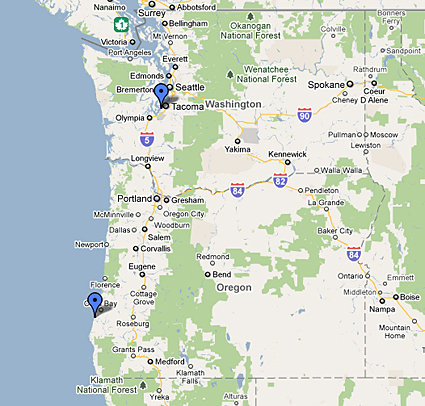 to play Chambers Bay. 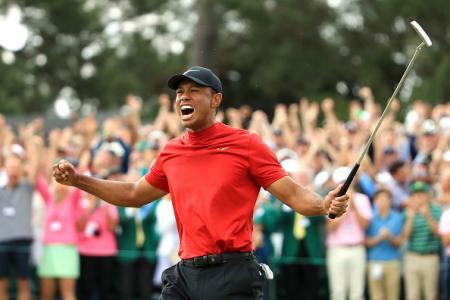 I've a good mind to put Chambers Bay in the list of Top 50 GolfPunks of all time. But it's not a person. Maybe we'll do a Top 50 GolfPunk Courses Of All Time. 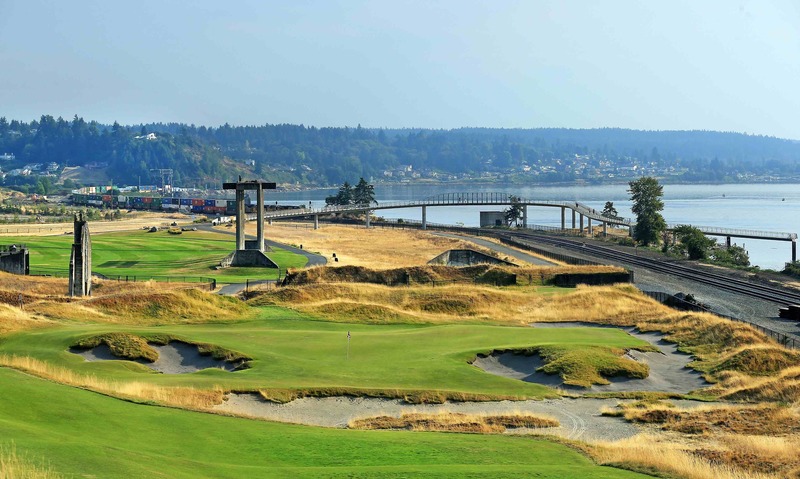 Anyway, the design brief for Chambers Bay (located about 40 miles from Seattle) was simple yet ambitious: Robert Trent Jones II was asked to create a world-class golf course, enjoyable for golfers of any skill level, but also capable of hosting major championships. 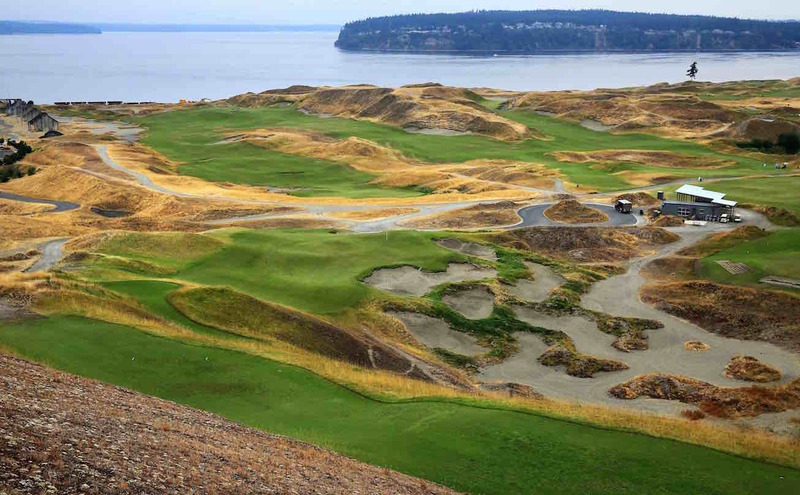 Built on the site of a former sand and gravel mine adjacent to Puget Sound, Chambers Bay gave the architects an ideal medium upon which to build a traditional links golf course. The amazing views of Puget Sound and the Olympic Mountains provide a stunning backdrop for golfers, not only to enjoy world-class golf, but also a sense of visual ecstasy. But this was no easy ride for Robert Trent Jones II and his band of merry greenkeepers. The land set aside for the golf course was degraded after a century of industrial usage but contained curious and mesmerising landforms shaped by wind and weather. The design team used these landforms as the scaffolding for the golf course design. They crafted a dramatic links landscape by clearing non-native vegetation and reworking the sand piles left from mining operations into massive dunes. They then routed the golf holes between, over, and around these dramatic features and planted the entire course in fescue, the grass found on traditional British links. 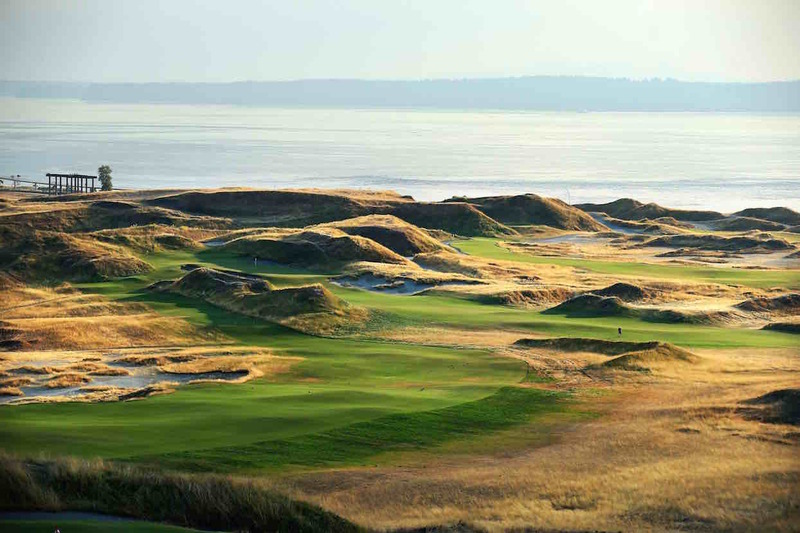 Much like the traditional links courses of Scotland, Robert Trent Jones II designed Chambers Bay to encourage the imaginative and creative shotmaking that epitomizes links golf, particularly along the ground. 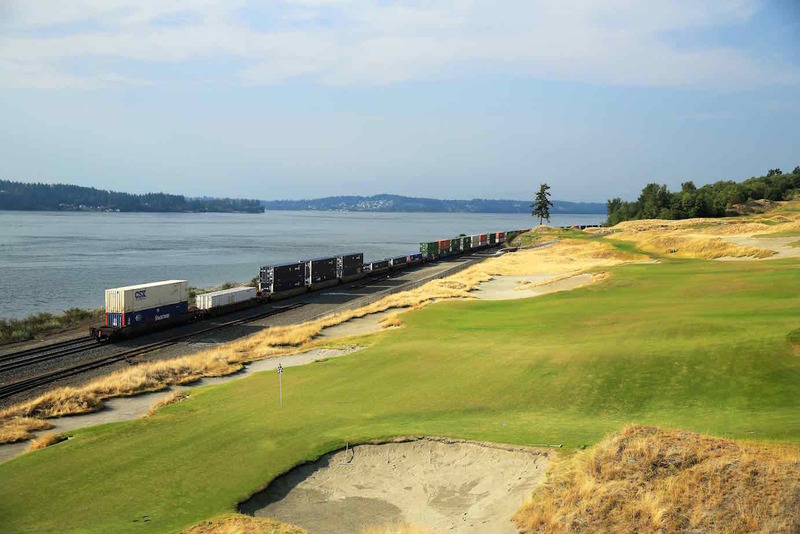 There is no "line of play" around Chambers Bay, but rather an infinite number of strategies from tee to green that will get the player around the course successfully. 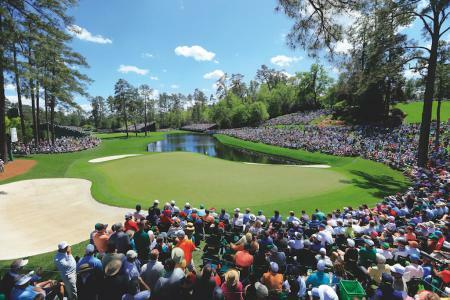 Shot makers like Bubba, Rickie Fowler and Phil Mickelson will love it here. Risk/reward opportunities abound, though wide fairways welcome all golfers to swing away. Train tracks border the golf holes as they do at such iconic links courses as Prestwick (my all-time favourite golf course, if you're interested...) and Royal Adelaide. And "ancient” ruins – from the site’s mining era – are visible from a number of holes, as at several links courses in the British Isles. A public walking trail winds through the course, allowing walkers to form impromptu galleries, just as they do at St. Andrews. No housing mars the purity of the golf holes, and as Chambers Bay is a continuously turfed, walking-only venue, no cart paths intrude upon the natural look. All in all, lovley stuff. The only thing I'm not happy about is I won't be there. For anyone making the trip it looks like you're going to have an unbelievably brilliant caper. For more information about Robert Trent Jones II and his course design philosophy, visit the Robert Trent Jones II website. 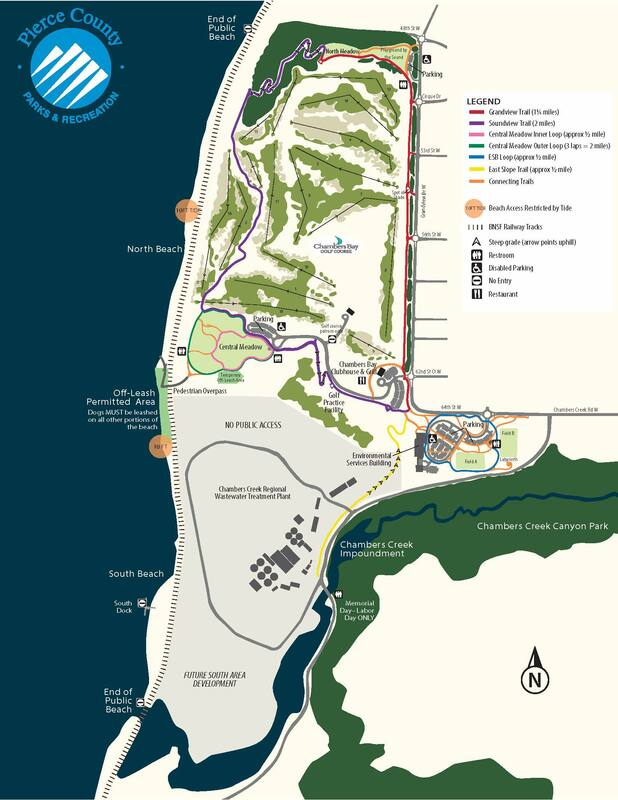 Chambers Bay is situated on 950 acres located along the shores of the Puget Sound in University Place, Washington.